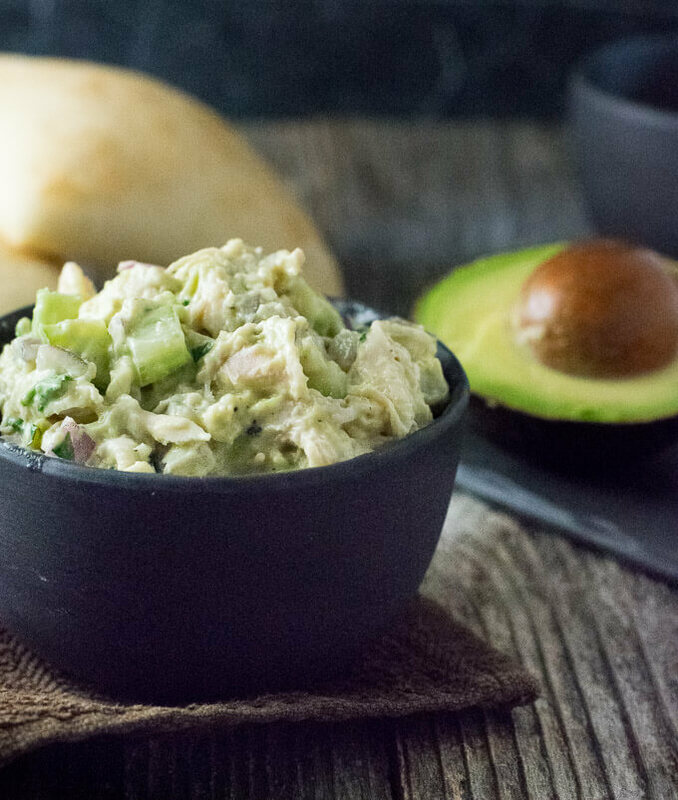 Making this healthy chicken salad recipe with greek yogurt and a blend of avocado gives it great flavor with all of the creaminess you expect from a great chicken salad! My favorite salads don’t have any lettuce in them. If God wanted me to eat leaves all day he would have made me a bunny rabbit. However, that doesn’t mean I don’t want my salads to be healthy. 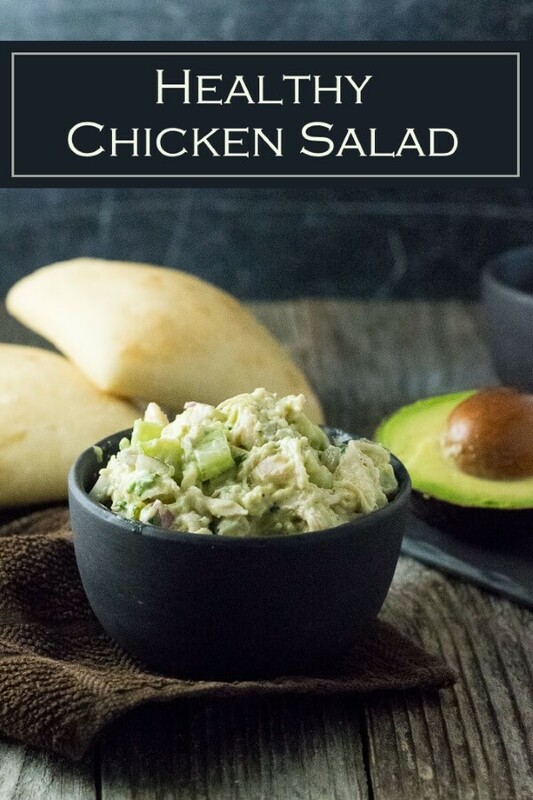 I switched up the traditional chicken salad and made a few healthy substitutions to ensure I could enjoy one of my favorite meals with zero guilt! The best way to cook chicken for chicken salad is to NOT cook chicken for chicken salad. Seriously. Buy a rotisserie chicken at your grocery store instead. The rotisserie chicken is already cooked, it is incredibly tender and incredibly flavorful. In other words, is it PERFECT for chicken salad! A classic chicken salad is not typically a “healthy” salad since it gets its creaminess from a generous helping of mayo. There are other variations like a chicken salad with apples or grapes and pecans that include healthier additions, however, everything is still swimming in a fatty sauce. The best way to create a healthy chicken salad is to swap out the mayo. 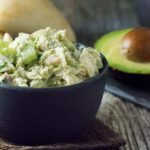 I make my healthy chicken salad recipe with greek yogurt and a blend of fresh avocado to create a lot of great flavor while maintaining the creaminess you expect from a chicken salad. Chicken salad is fantastic for making quick sandwiches. You can keep the chicken salad sandwich healthy by using whole grain wheat bread, or low carb wraps, depending on your diet. Honestly, my favorite way to enjoy them is to toast up some Ciabatta buns. It isn’t the healthiest option, but it fits in with a balanced diet. This recipe is pretty straightforward, the only potential issue is getting the perfect amount of creaminess. Depending on how thinly you shred the chicken you may require more Greek Yogurt. If your dressing isn’t as creamy as you prefer, feel free to add up to an additional 1/4 cup of Greek yogurt. Anyone who has cooked with avocado can tell you it does not store well. 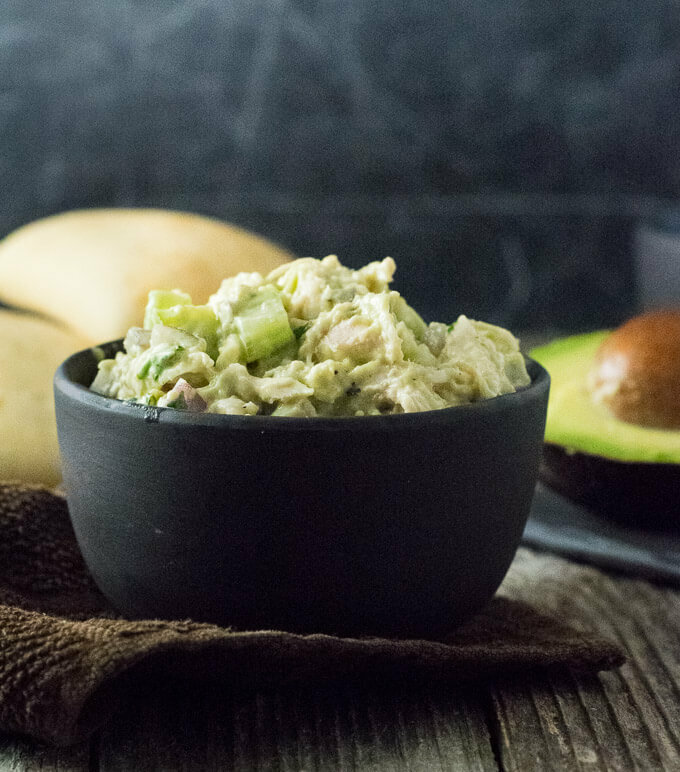 Typically, avocado-based recipes, like my avocado egg salad and avocado tuna salad must be consumed shortly after they are prepared or the avocado will oxidize and blacken. However, there is a trick to storing this healthy chicken salad successfully. 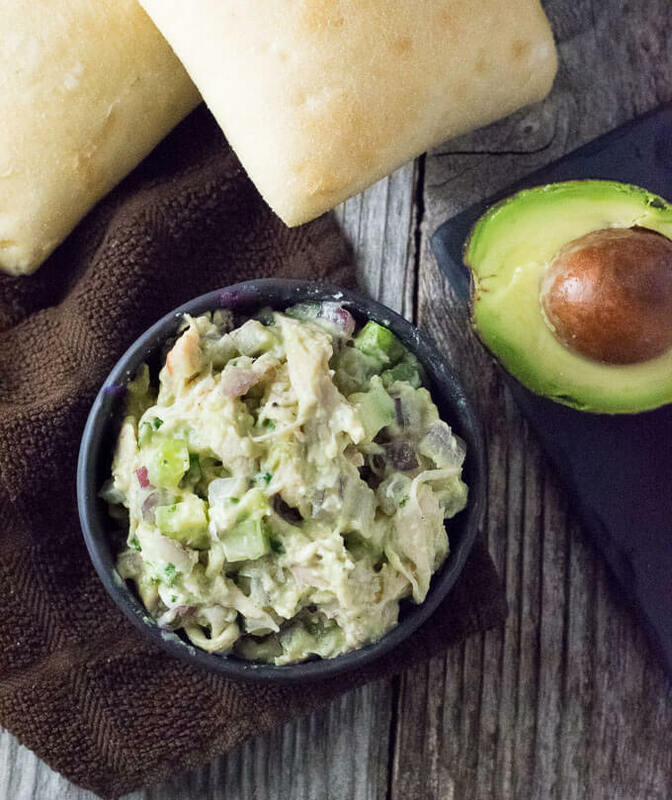 Store any leftovers in a bowl and place a sheet of plastic wrap (affiliate link) tightly over the top of the chicken salad, ensuring 100% contact. By eliminating any air between the chicken salad and the plastic wrap you prevent the chicken salad from oxidizing. 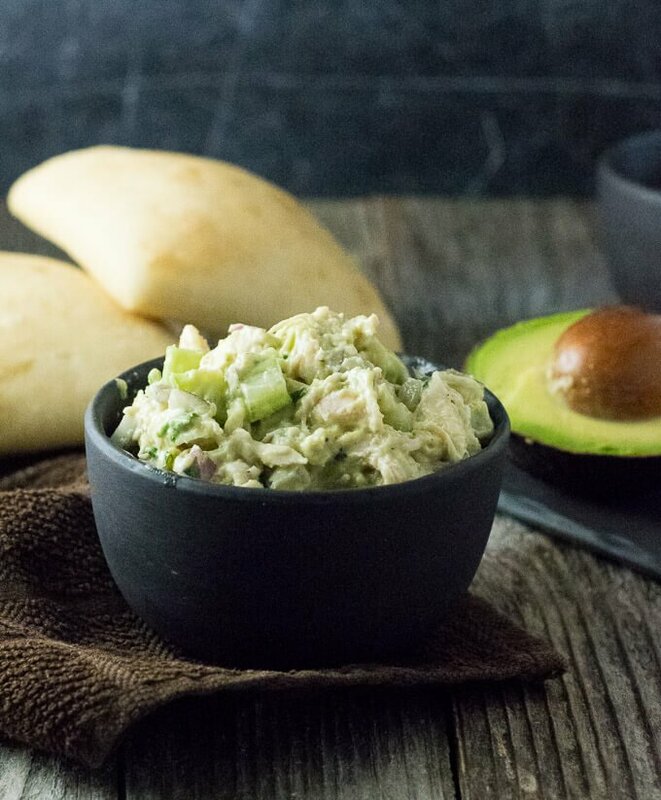 I have stored this chicken salad in my refrigerator for days using this method. Place Greek yogurt, avocado, Dijon, and lemon juice in a large bowl and mix to combine, mashing the avocado as you stir. Avocado should be mashed so it is creamy enough to blend into the dressing while some chunks remain for texture. Add chicken, celery, onion, cilantro, and seasonings to the bowl and mix to evenly coat with the dressing. Feel free to add up to an additional 1/4 cup of Greek Yogurt for more creaminess. IF YOU LIKED THIS RECIPE check out my BBQ Chicken Salad recipe too! If you enjoyed reading my Healthy Chicken Salad recipe then you should probably like me on Facebook and follow me on Pinterest too. That’s what I would do at least, because if you don’t get to know me but you still use my recipe it is kind of like taking candy from a stranger, and your mom taught you not to do that. Don’t disobey your mom, subscribe to Fox Valley Foodie today! Absolutely love a good chicken salad. This looks yummy.